When LeRoy Carter came to Everett in 1946, he didn’t plan to stay. World War II had just ended and he was serving aboard the cargo vessel USS Tate. The ship had been damaged in the invasion at Okinawa and was brought to the Everett Shipbuilding and Drydock Company for repairs. A blind date with Marilyn Nowak changed his life. A year later he and Marilyn married and soon went into business partnership as well, starting Carter’s Drug Store at 2215 Broadway Avenue. Their marriage lasted 61 years and they ran the store for 41. When Pearl Harbor was bombed on December 7, 1941, Le Roy was in his senior year at a North Dakota college, planning to become a pharmacist. His school allowed him to fast track courses so that he could obtain his pharmacy license before enlisting in the Navy. Marilyn was an Everett girl, born in Tye, Washington, who had moved with her family (the Nowaks and the Goldthorpes) following a fire that destroyed the small town in the late 1920s. In Everett, she attended Garfield, North Junior and Everett High schools. Following a large wedding—with five bridesmaids and a wedding cake made by collecting wartime sugar rations—LeRoy and Marilyn took up residence in Everett. Le Roy began working for Herb Knudsen at City Drugs, a business that could trace its roots to the early 1900s. With financial backing from his father, Le Roy was able to begin Carter’s Drug Store in a building constructed by Marilyn’s aunt, Naomi King to house a snack shop and the pharmacy. From the start, Marilyn was a full-time business partner, not only helping Le Roy but working in the snack shop as well. The Carters had plenty of competition. When they opened their doors in 1948, there were already 22 other drug stores in town. In order to succeed, Marilyn and Le Roy knew they had to work harder than the rest. Other drug stores in Everett were closed on Sundays and on week days were open only until 6 p.m. Carter’s was different. The drug store operated every day—even holidays—from 10 a.m. to 10 p.m. Marilyn recalls that LeRoy once worked for 18 months straight without a day off. To local residents, the Carters were family. They were trusted and respected and their good reputation extended well beyond Everett’s boundaries. It was not unusual for customers to travel long distances on holidays for needed prescriptions and over-the-counter medicines. In Marilyn’s words, “Fourth of July was wild” as they often treated injuries from fireworks. In the 1940s the practice of “clinical pharmacies” had begun, which allowed licensed pharmacists to offer patient care in emergencies, thus optimizing the healing. And physicians trusted Le Roy to prescribe for their patients while they were away. Having lost his mother when he was young, LeRoy considered Marilyn’s mother to be his own mom and she came to live with them. When the Carters first baby arrived, Grandma Nowak helped with the child care. But often, the Carters cared for the baby in the pharmacy while waiting on customers. The Carters raised a son and a daughter. When the children were older, they worked in the pharmacy on holidays and customers would stop by to give the family holiday greetings. At times when a customer needed medicine for a child and could not pay, the Carters did not charge. Carter’s sold greeting cards and gifts, along with drugs. Marilyn became clerk, buyer and a Class A Pharmacist Assistant, which allowed her to count and package pills and keep business records. And on the occasional times when they briefly did not have a delivery boy, she and Le Roy personally delivered orders to homes and businesses. Marilyn remembers one delivery vividly. The customer was a local tavern owner. Marilyn was pregnant at the time and that day had to take her older child along with her in a stroller. She chuckles when recalling the tongue-lashing she received from a concerned woman watching her enter and exit the tavern, one child in tow and another on the way. The Carters entered the pharmacy business at the height of the polio epidemic. Marilyn remembers the huge relief that came when a successful polio vaccine was made available in the 1950s. At this time also sulpha and penicillin were beginning to transform medical treatment of many illnesses. A big scare would come in later years from HIV and, in the first years of its diagnosis, even pharmacists feared coming in contact with ill patients. Part of a pharmacist’s work involved educating the public about disease prevention and medication. But drugs themselves could also be the culprit and patients generally came to their pharmacist first if they had an adverse drug reaction. This practice ended as insurance coverage became a necessary part of the pharmacy business. There were sometimes substandard drugs on the market too but Le Roy made a practice of dealing with only respected pharmaceutical companies. 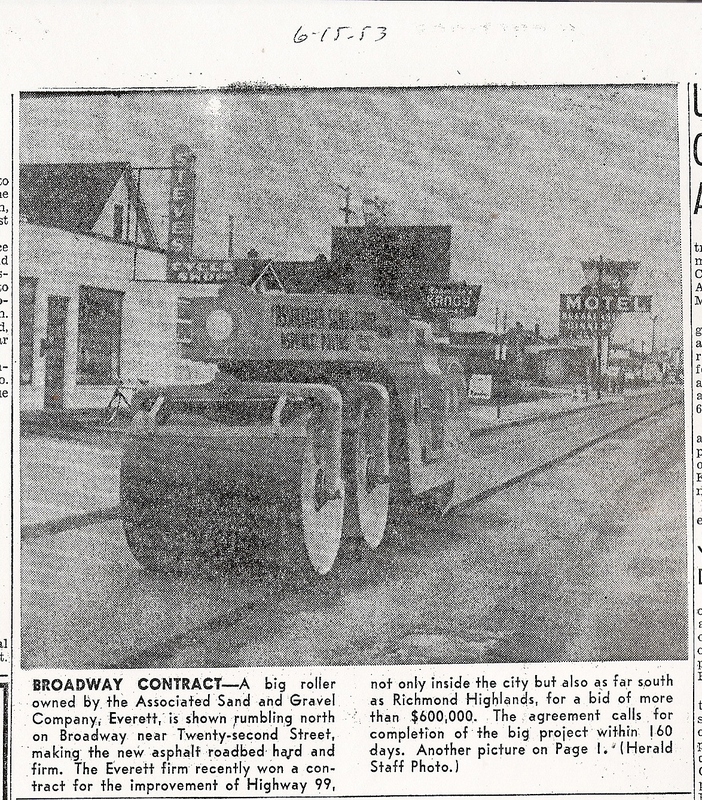 In the 1950s street improvements were made to Broadway Avenue and Carter’s opened in a new store. After seven years in its original location, the pharmacy was moved to a new concrete block building a half block south at 2227 Broadway. The new store featured a towering neon sign, lots of plate glass, a blue and white interior color scheme and a terrazzo floor. They now had more elbow room. Carter’s Drugs officially opened in its new location on April 1 and 2, 1955, offering gifts to all who stopped in on those days. The Carters promised to provide a complete line of pharmaceuticals and sundries. In the years that followed “sundries” even included chocolate eggs that Marilyn made and sold at Easter. 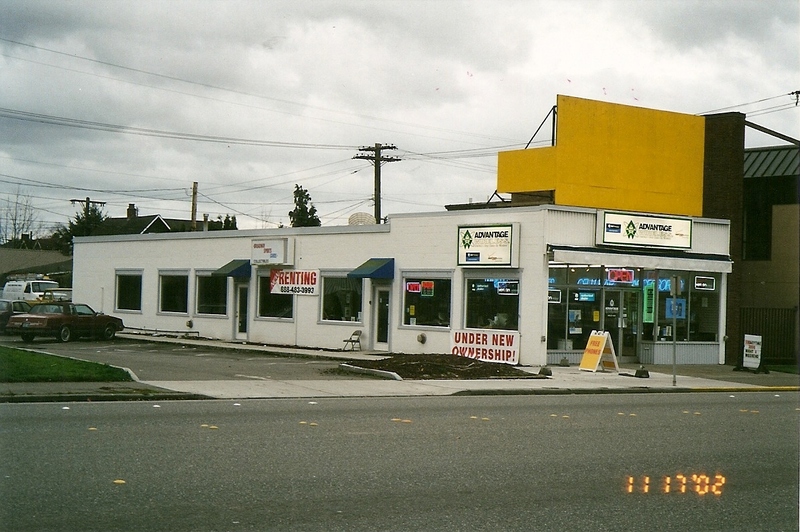 Three of Everett’s largest pharmacies were Carter’s, Tozer’s and Owl Drugs. Eventually the Carters owned all three, Marilyn working shifts at each one. After 41 years in business, the Carters retired and sold the pharmacy to Jerry Rock who continued the pharmacy under the Carter name for another decade. Today both Carter’s Drug Store buildings, as well as the Carters first home, are gone. LeRoy died on January 2, 2008, at the age of 87. As a tribute to the history of early pharmacy, Marilyn has given the artifacts she has saved from Carter’s and Tozer’s to the Marysville Historical Society and hopes to see them one day displayed to show the history of pharmacy over the years, from the days when medicines were compounded from plants to the rise of large pharmaceutical companies and ever-newer medications. From historian David A. Cameron, originally of Everett, now Index. Barbara George, Lita Sheldon, Margaret Riddle and Wendy Becker video interview with Marilyn Carter, October 2009; Phil Dougherty, HistoryLink.org essay, “Pharmacy in Washington State: A History,” June 12, 2010; Nancy Rockafellar, editor, Saddlebags to Scanners: 100 Years of Medicine in Washington State, Washington State Medical Association, Seattle, 1989. Images Courtesy of Jack O’Donnell. Text Courtesy of Margaret Riddle. a post title that makes people desire more? I mean Carter Drugs | Everett Museum of History is kinda boring. create news titles to grab viewers to open the links. Thank you for the feedback, but I’m not sure which post you are referring to called “Carter Drugs”. Do you have the date? It may not be linking to our blog. Thank you so much for the kind words. We are doing our best to get the word out and find the museum a permanent home. Hopefully that day will come soon and we will have tons more treasures to share.